For the past 12-18 months, GIGABYTE’s BRIX platform has made inroads into the small form factor ecosystem with the help of Intel’s Haswell and AMD’s APUs under the hood. Ganesh recently had a look at the BRIX Pro, featuring a Crystal Well enabled Haswell processor with Iris Pro 5200 integrated graphics. We have also reported from press releases of BRIX models with discrete AMD mobile GPUs in the pipeline, resplendent in a deep red color. Naturally the next stage was to expect a green model featuring an NVIDIA GPU, at a private event in Las Vegas this week GIGABYTE has demonstrated just that. Geoff from TR spotted this little cube at the event, sporting a 47W Core i5-4200H mobile CPU (dual core, hyperthreading, 2.8 GHz / 3.4 GHz turbo) and a GTX 760 inside. It is unclear if this is a mobile GTX 760M (768 CUDA cores at 657 MHz) or the full GTX 760 (1152 CUDA cores at 980 MHz) on a custom design. The 760M is rated ~55W and the GTX760 is rated at 170W, meaning a total chassis power output of either ~100W or ~220W. Given how loud the BRIX Pro seemed to be, one would assume that GIGABYTE has aimed towards a mobile GPU. We are awaiting confirmation from GIGABYTE on this detail, although it was reported that the device was warm to the touch during a GPU demonstration. Aside from the core hardware, standard BRIX rules applies – two SO-DIMM slots, support for 2.5” and mSATA, 2T2R 802.11ac with BT 4.0, gigabit Ethernet, four USB 3.0 ports, dual HDMI and a single mini-DisplayPort connector. 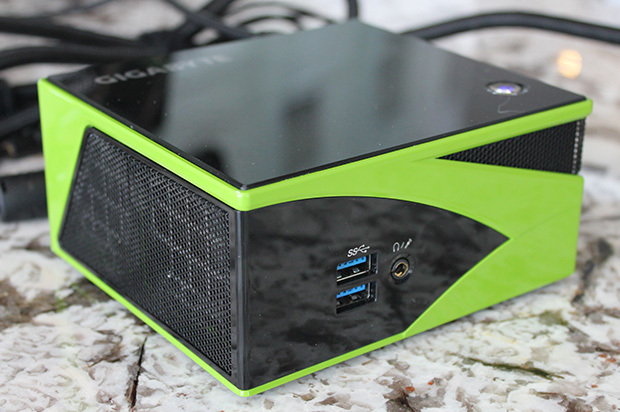 Given the size of the connectors on the image above, the BRIX GeForce Edition is a similar size to previous BRIX models. No word on pricing as of yet, however this should hit the shelves in May. An i7 version is also said to be on the cards.